Whisky Oss - Oh yes, a classic there! Oh yes, a classic there! That was the Arran-reply on Twitter when I posted my latest add to my collection. It's actually the same reaction I had when I found this bottle on the internet, not even knowing about the details then. Who cares about details anyway? 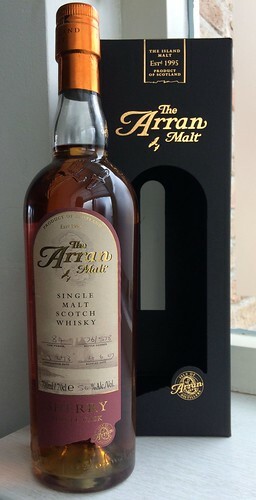 It's Arran, it's Single Cask, It's Sherry Cask matured and bottled at Cask Strength. Oh yes, and it wasn't expensive at all! In the last 6 months I was very lucky to get my hands on some very nice Arran drams. At the Pot Still Festival in Amersfoort I tasted The Dark Lord and The White Wizard. At the International Whisky Festival in The Hague I tasted a sample of the Cask Strength Bere Barley. All three have been released recently in small batches and are sold out as we speak. Then there was the Facebook tasting! I was one of just 20 people who were send some very nice samples to review in a world wide tasting event on Facebook. The 10yo and the 14 yo from the core range but also a Chateau Margaux and a very young peated Whisky, both still maturing, were reviewed at that event. OK Arran, you've got my attention now! As a result the first bottle I bought this year was a 12yo Arran bottled in the McGibbon's Provenance series. A very nice find as well. A few days ago one of the members of The Single Malt Whisky Group on Facebook mentioned a Groupon offering. It was possible to buy a €20 discount at Drankdozijn. All you had to do was subscribe and pay €10 for it. I'm not a stranger to the Drankdozijn website so I started the search immediately. The result: bottle 76/578, bottled from casknumber 84 at a 56%ABV at the Arran Distillery. Distilled 3-2-1998 and bottled 4-6-2007, so after only 9 years of maturation, this cask was especially selected because of it's development. Almost 8 years later it was still there. It must have been waiting for me! Finish: Lovely long finish, sherry sweetness at first, later more like the aftertaste of coffee. Great to have this bottle in my collection! At this young age it would still deserve 86 points in my book! 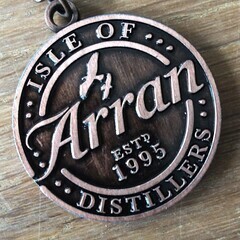 This will definately not be the last Arran-blog you'll see on our website! Peter has bought a great bottle as well and there still is more to come!